Many cultures around the world ring in the New Year with specific dishes that tradition holds bring good luck or blessings in the year ahead. In Italy, that traditional dish is Cotechino Sausage with Lentils, often served at midnight on New Year's Eve. 1 qt lentils (we use lentils de puy), cooked in water until tender, strained and cooled. Pre heat oven to 350˚. Place a large ovenproof skillet on medium heat, add 1 Tbls oil. When oil is simmering add the sausages and brown on one side, about 2-4 minutes. Flip the sausage and place in the oven. Cook the sausages until they reach and internal temperature of 165˚. Remove from the oven and set aside. Meanwhile in a sauce pot over medium heat add the remaining oil, when the oil is simmering add the shallots and cook until translucent, about 1 minute. Add the carrots and cook until slightly tender. Add the lentils and chicken stock to the sauce pot, season with salt, pepper and the vinegar until properly balanced. Heat the butternut squash in a sauce pot. 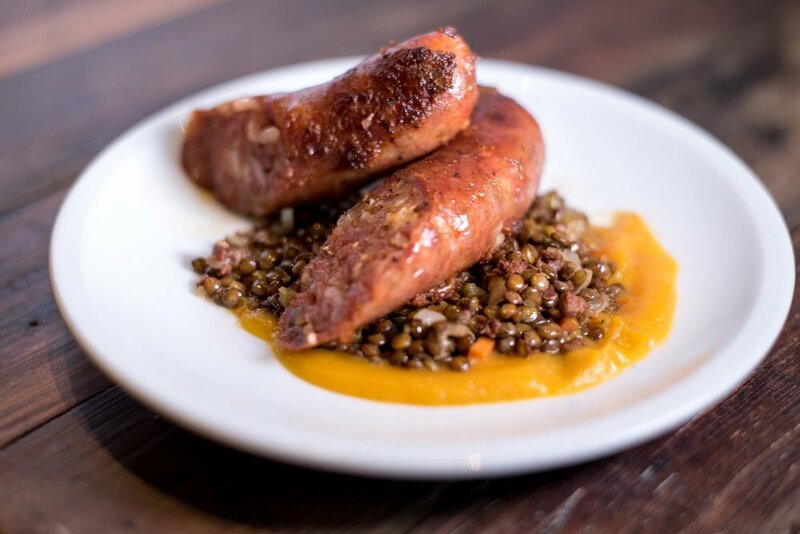 To serve, spread the butternut squash over a serving platter, spoon the lentils on top of the squash, slice the sausages and place over the lentils, garnish with chopped parsley. Serve immediately.